At one point in Roadwork, middle-aged Barton Dawes contemplates his crumbling marriage and reminisces about earlier days with his soon-to-be ex-wife: “They had had good years before. He was sure they must have been good because he couldn’t remember much of what had happened in them.” Funny, that, because don’t the psychologists tell us that we tend to recall the good times, and block out the bad? That’s one difference between Stephen King books and those written by his dark half, Richard Bachman. 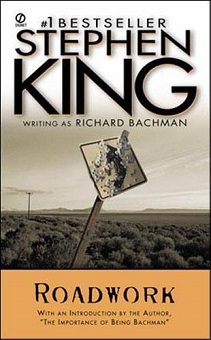 Novelist King provides an occasional glimmer of hope for his characters, but Bachman people tend to dwell on the downside. Roadwork is atypical King in other ways. Unlike in most of his novels, we spend the entire story inside the head of just one character, the despondent Mr. Dawes, a Midwesterner who doesn’t react well, to put it mildly, when 1) his child dies; 2) his wife leaves him; and 3) his home and business are targeted by eminent domain. Also, there isn’t a hint of the supernatural in Roadwork – and that’s a good thing. So is the fact that this was published in 1981, when King/Bachman was at his peak.